World Immunization Week is celebrated annually during the last week of April. The global public health campaign aims to raise awareness on the importance and benefits of vaccinations and to ensure every person is protected from vaccine-preventable diseases. UNICEF Cambodia travels with health worker Vorn Vannak to witness his mission to vaccinate children in northeastern Cambodia. KRATIE, Cambodia, 24 April 2018 – Most weekday mornings, you’ll find Vorn Vannak at the health centre in northeastern Cambodia’s Sambo village, where he vaccinates children. 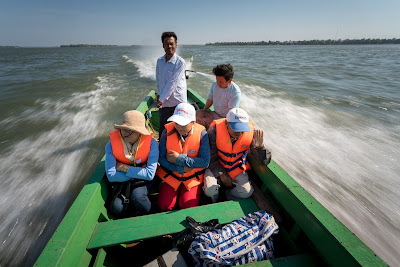 But today, he’s speeding on a boat down the Mekong River, headed for the sleepy village of Koh Sam, about 8 kilometers away. with Senmonrom commune chief Thuan Threl. 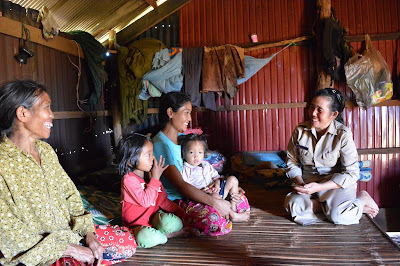 Mondulkiri Province, Cambodia, April 2018 – Meet Sroul Phyum, 29, a single mother of four who lives in Senmonrom commune, in the north-eastern province of Mondulkiri. Her house is dark, lit only by the light leaking through the doorway and the cracks in the wooden walls. Her simple home is made up of wooden planks and sheet metal panels, with a dirt floor. Vat Sereyroth is passionate about advocating for youth. Phnom Penh, Cambodia, April 2018 – Nineteen-year-old Vat Sereyroth is a high-school student who is using her youthful energy to initiate change and make Cambodia a safer place for children to grow up in. Phnom Penh, April 2018: At 7.30am in Khan Sen Sok, on the urban outskirts of Cambodia’s capital Phnom Penh, the main highway past the airport is already heavy with trucks, tuk tuks and weaving motorcycles. Just off this main road and down a newly paved alley, a school bell rings. Inside Borey 100 Khnorng preschool, it’s time to begin the day.